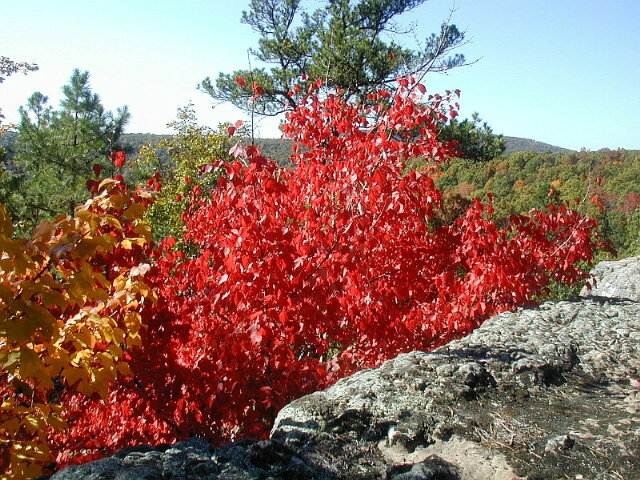 This RV trip took us from Richmond into the beautiful Ouachita & Ozark Mountains of Arkansas at near the peak of the Fall leaf colors. We had a lot more "incidents" occur on this trip than we are accustomed to, but we really enjoyed the days of visiting with family, and hiking & camping in the national forests. Our trip was cut short when Kay's mother needed our help back in Houston. All in all, it was a good trip and the good memories will outlast the mishaps. We hope you enjoy our story and photos. We left home a little after 9:00 AM on Monday, October 16th and drove north from Houston on US-59 to near Livingston. It had been heavily raining in the Houston area, with flooding reported on some side streets, but we made it out of Houston on the freeway just fine. When we got to within a mile of Livingston, the traffic stopped and we sat still for almost 2 hours. Lawson got on the 2-meter HAM radio and found out that the highway, as well as many other roads around Livingston, were flooded and it was continuing to rain. We managed to maneuver the trailer onto the shoulder and make a U-turn and head back south on US-59. At Shepherd, we went west on TX-150/156, US190, TX-19 & TX-94 to Lufkin. We were able to make it to Nacogdoches, where we spent the night at Village Park RV Park. That night we discovered our water heater wouldn't ignite, so we heated water on the stove to do the necessaries. Tuesday morning we continued up US-59 and stopped in Texarkana at an RV repair shop and replaced a diode in the igniter - nice hot water again! Afterwards, we drove north on IH-30 to Lake Catherine State Park near Malvern and Hot Springs, AR. 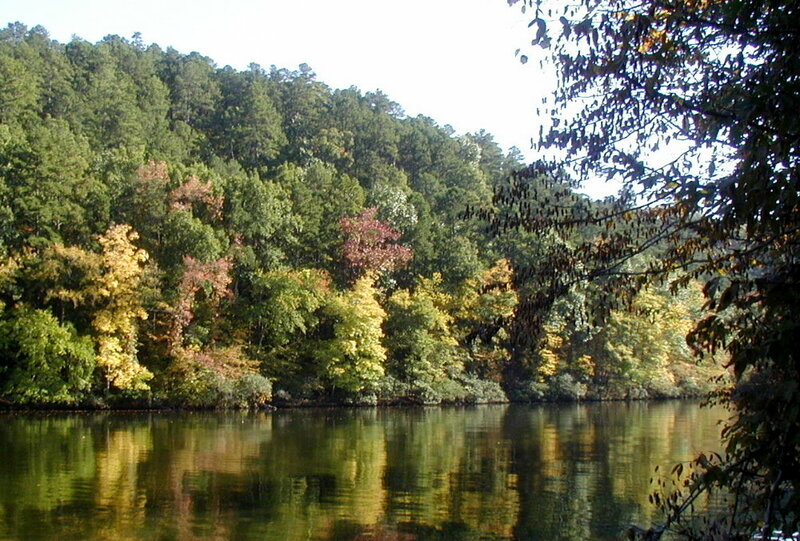 There is a long winding scenic highway that leads to the beautiful 2,180-acre Lake Catherine State Park, set in the beautiful forests of the Ouachita Mountains. < Our campsite at Lake Catherine State Park. < Lake Catherine. Wednesday we decided to check out two of the hiking trails in the park. That morning we took the Horseshoe Mountain Trail. 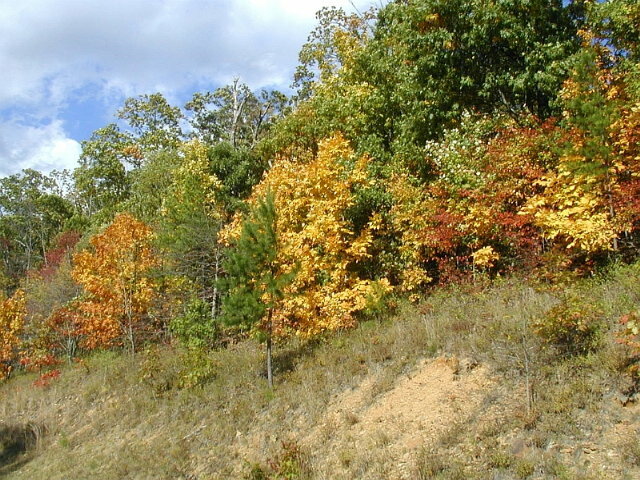 This trail is 3 ½ miles long and is steep and rugged at the beginning and end. They recommend 2-4 hours to complete the loop. In the afternoon we hiked the Falls Branch Trail. 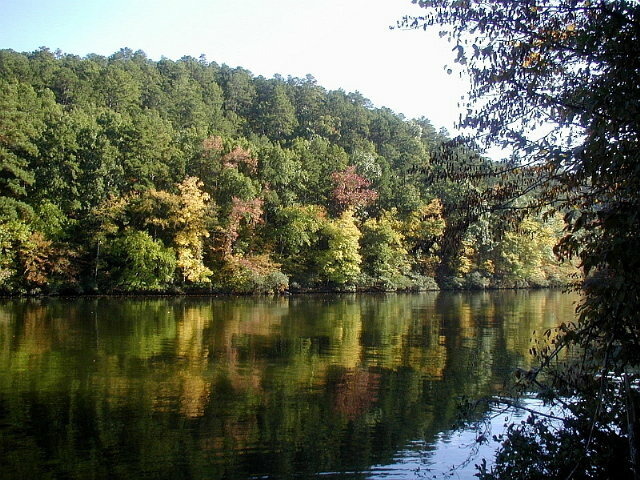 This trail is the shortest and easiest of the park's trails, two miles long and takes about 1 ½ hours to travel. Both trails are interesting, but the Falls Branch is the most interesting because it has a nice waterfall. 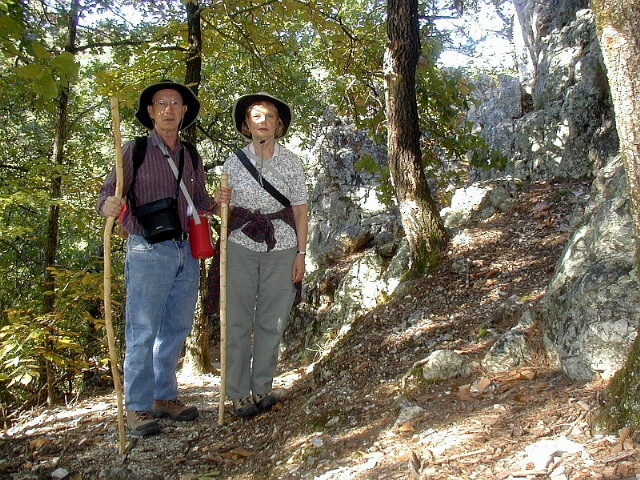 < Lawson & Kay on Horseshoe Mountain Trail. Thursday we drove up IH-30, IH-430, IH-40 & US-65 to Clinton, then AR-16/9 to Mountain View, where we would meet Lawson's sister and brother-in-law for the weekend. 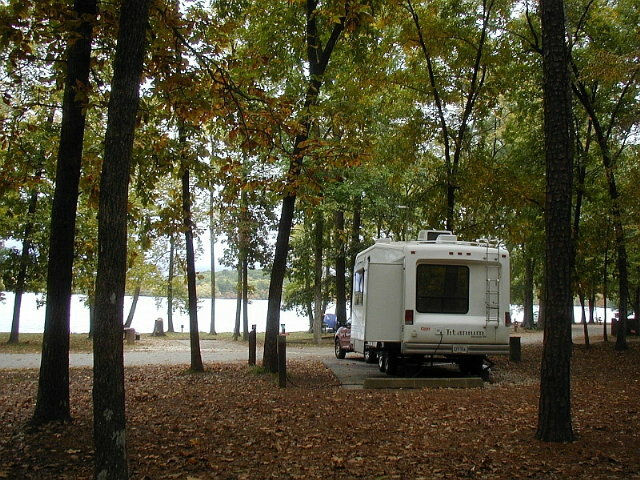 We stayed at the Ozark RV Park, which is adjacent to the Ozark Folk Center State Park. Friday morning, while waiting for our guests to arrive, we drove about 10 miles north of Mountain View to Blanchard Springs Caverns State Park to look around. 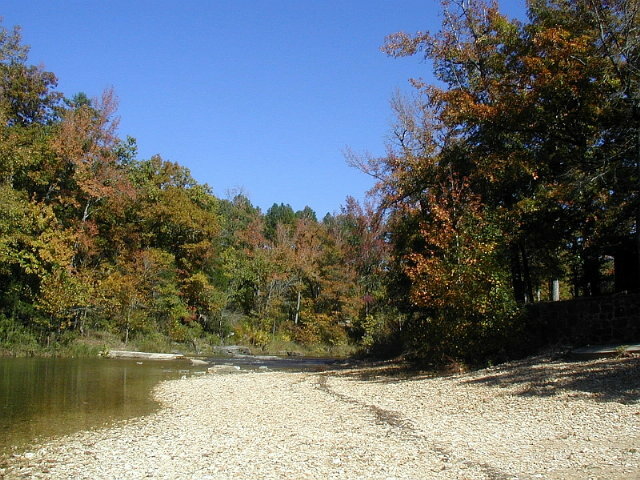 This park is located in the Ozark-St. Francis National Forests on North Sylamore Creek. 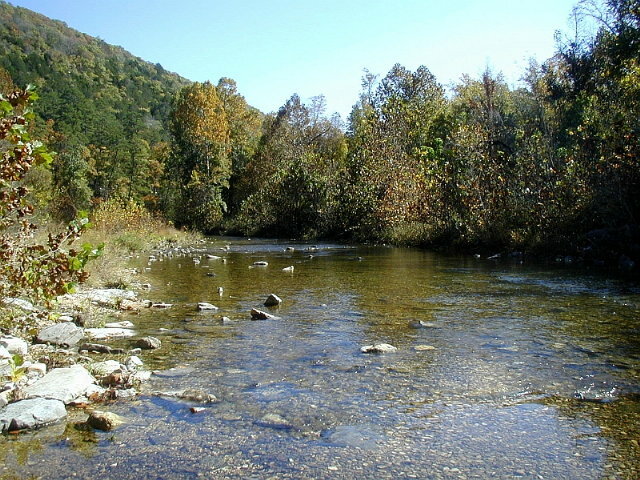 In addition to swimming in the creek, there are hiking trails and the caverns, which would be nice in the heat of summer. We scouted out the RV campgrounds for possible future use. 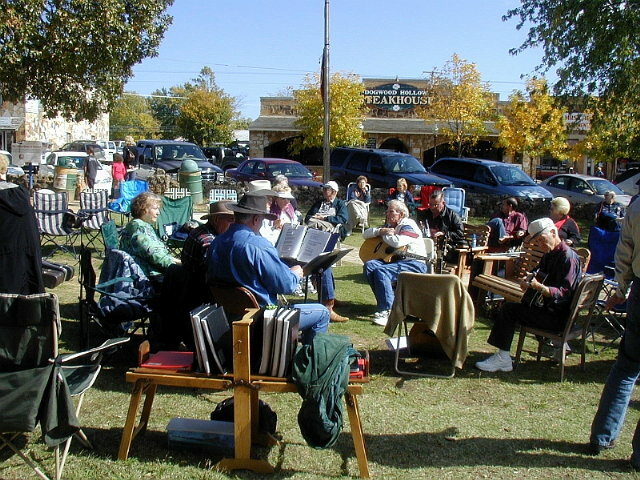 After driving driving around the park we went back to our campground in Mountain View and when our guests arrived, we ate supper and afterwards went down to listen to the groups that congregate around the courthouse square and play bluegrass music. 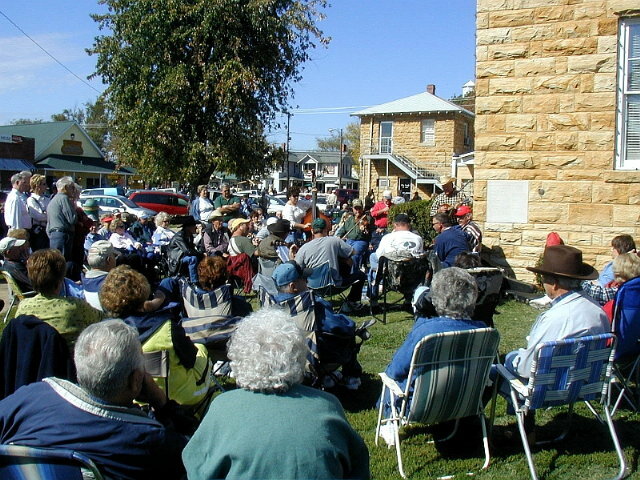 Saturday afternoon we went back to the town square and listened to the bluegrass music again. The ladies checked out some of the craft and antique shops nearby. 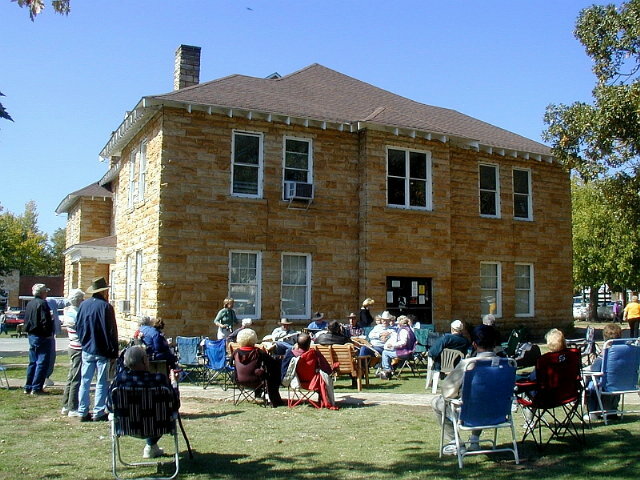 There were probably 20 or more informal groups of musicians gathered at various spots around the courthouse. Some were more formal than other, but the musicians & spectators moved freely between groups through the afternoon and into the night. 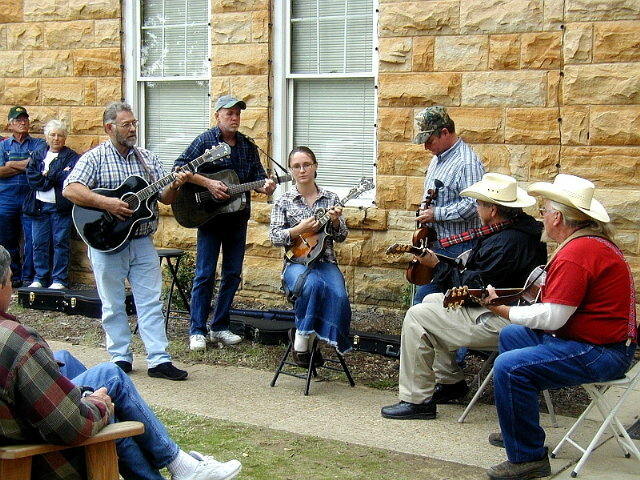 < Bluegrass music at Mountain View. Sunday we all attended a church service at the recreation building in the RV park. They announced that a group would be singing at Sylamore Baptist Church north of Mountain View, so after lunch we went and listened. After we got back to the campground our guests left for home. Monday morning we departed from Mountain View on AR-9, AR-16 & AR-123 and camped at Haw Creek Falls Campground southwest of Pelsor, AR. This is a very small and rustic National Forest Service campground. There are no facilities (dry camping only) except for primitive toilets and only 9 campsites. However, it is a very beautiful little park hidden in tall trees next a waterfall. 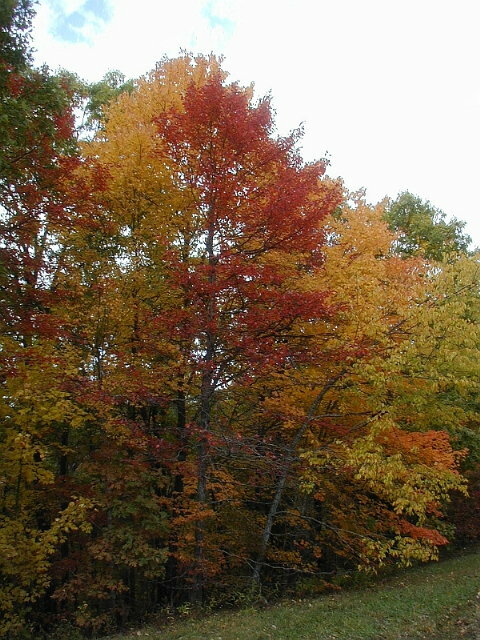 The leaves in the area were the best we have seen in many years. 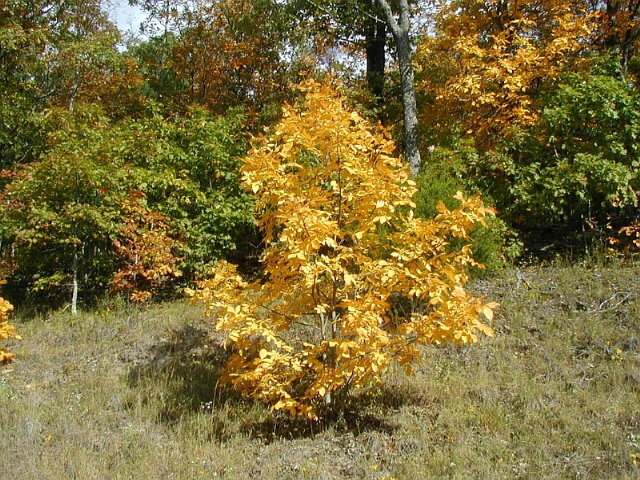 The park is located on the Ozark Highlands Hiking Trail which runs 165 miles from Mountainburg to Woolum, AR. 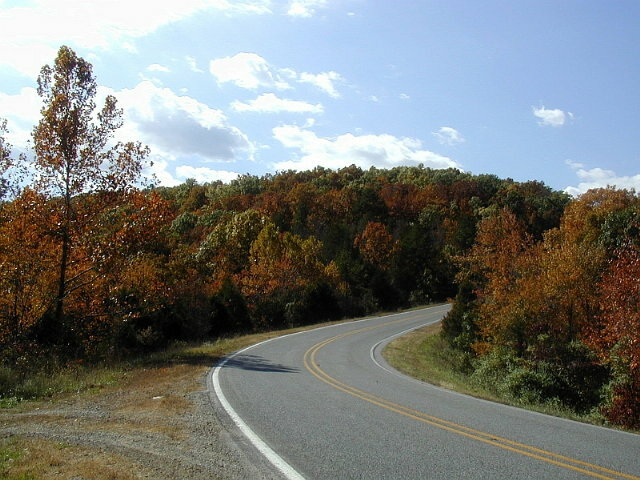 < Fall Colors along Arkansas Hwy 9 & 16. 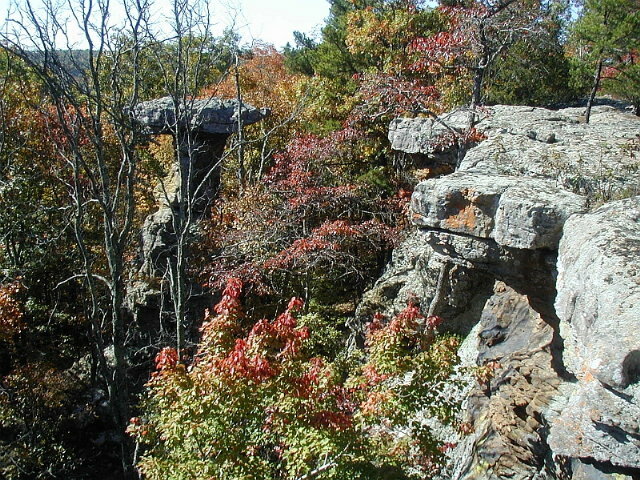 Tuesday morning we drove east on AR-123 & AR-16 about 6 miles east of Pelsor, to Pedestal Rocks Hiking Trail in the Ozark-St. Francis National Forests. 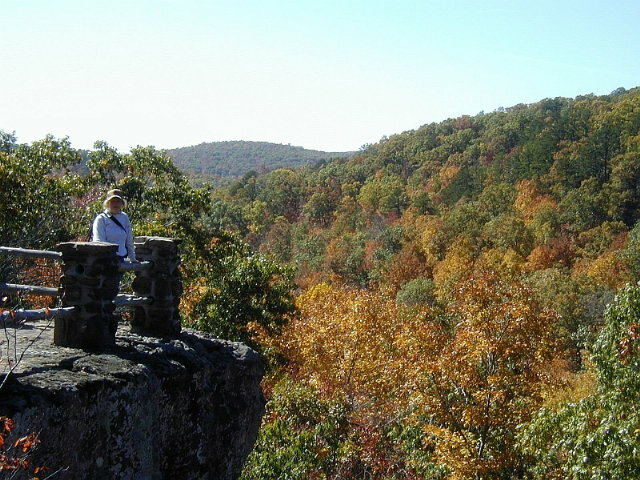 There are two trails, Pedestal Rocks loop (2.2 miles) and King's Bluff loop (1.7 miles). The trails are reasonably easy to hike. After our hikes, we drove north of Pelsor to Fairview Park to see what it looked like. 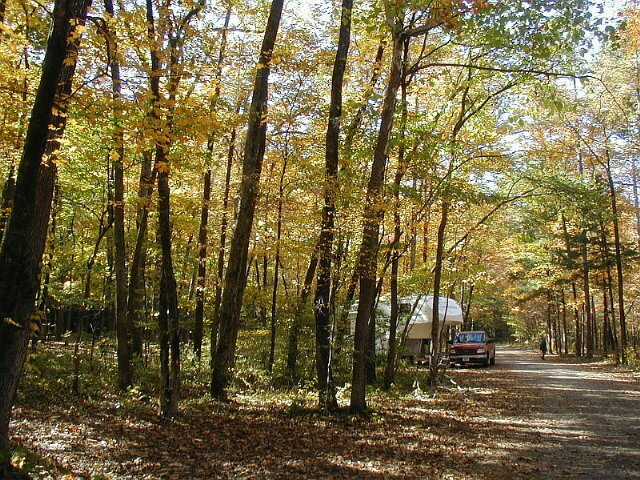 It is another small US Forest Service campground for dry camping. 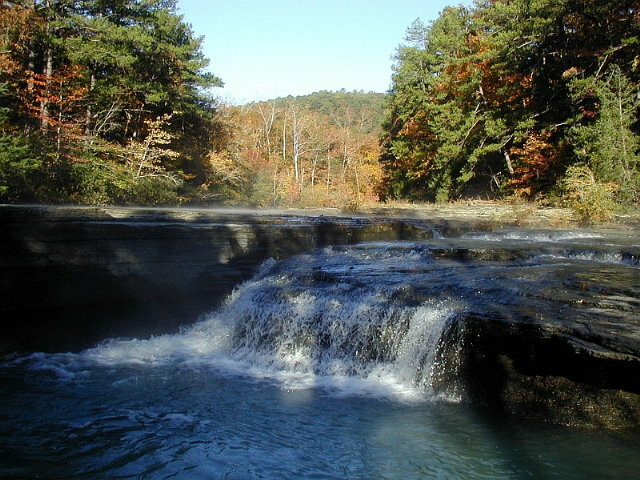 When we got back to Haw Creek Falls, we hiked about 2 miles on the Ozark Highlands Trail, from the campground to AR-123 and came back to the campground by the highway because it was getting near sunset. We noticed that our trailer battery was getting low, so there was a chance it wouldn't last one more night. 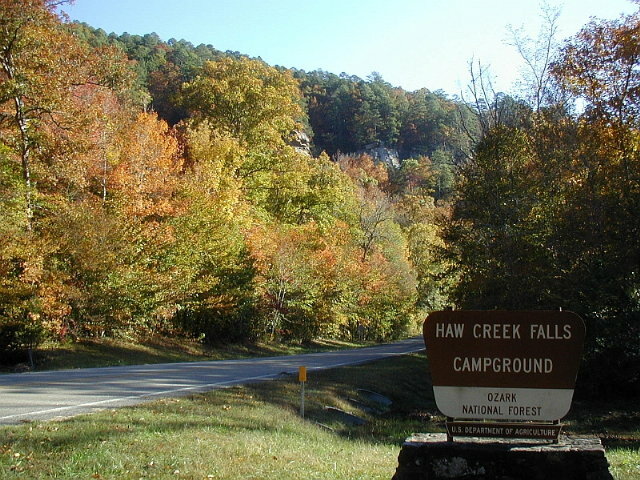 < Haw Creek Falls Campground entrance. < Our campsite at Haw Creek Falls Campground. < Haw Creek Falls. 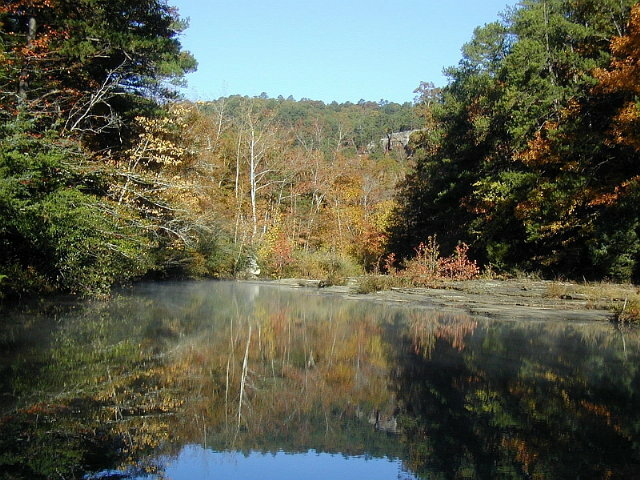 < Small lake above Haw Creek Falls. 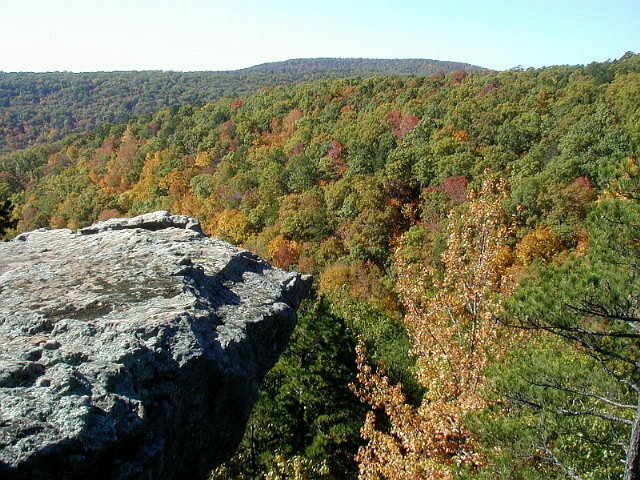 < View from Pedestal Rocks Hiking Trail. Wednesday morning we learned that the battery was too weak to operate the slide or jacks so we had to take it out and drive to Clarksville to get it charged. While it was charging, we ate breakfast at a nearby diner. When we got the battery back in the trailer, we discovered that the refrigerator was not working on gas, so he headed south on AR-123, AR-164 & AR-7 to Russellville to get it repaired. After getting the igniter replaced, we checked into Outdoor Living RV Park where Lawson got soaking wet in the rainstorm hooking up the utilities. Later that afternoon we learned that Kay's mother in her assisted living facility had fallen, so we made plans to return home the next day. Thursday morning, we got an early start and drove from Russellville back to Houston. This draws to a close our short visit to the mountains of Arkansas. We hope you enjoyed the pictures and brief descriptions of our activities. God willing, join us again soon for another RV adventure.